Cape Town - The Springbok Sevens team came up short at the Hong Kong Sevens after losing both their matches on Sunday, which saw them miss out again on the big prize at the iconic event. The team, however, remained in the top four on the World Rugby Sevens Series rankings. The Blitzboks went down 21-12 against the USA in the Cup quarter-final at the Hong Kong Stadium before being edged 19-17 by Argentina in the Semi-final of the 5th place playoff. 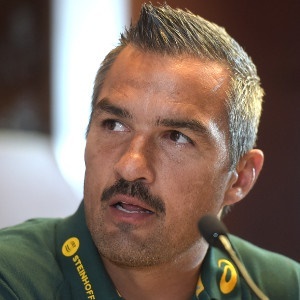 “It was a frustrating day,” said Springbok Sevens coach, Neil Powell. “We did not make the step-up required after doing well on day one and two. Powell said his young squad will learn from this. “It is frustrating to control the match, but not lead on the scoreboard,” said the coach. “This is something this group needs to learn. Against Argentina the same thing happened. The yellow card we received for a high tackle was crucial and we conceded a vital try." The Blitzboks held the lead in both matches. Against the USA, Impi Visser scored early for South Africa, before two blistering runs by USA winger, Carlin Isles, which first drew them level and then pushed them 14-7 ahead at the break. Visser scored soon after the restart to cut down their lead to two before Ben Pinkelman scored to edge the USA ahead again. The final five minutes was a desperate affair, but neither side could score. Against Argentina, tries by Soyizwapi and Branco du Preez had the Blitzboks up 12-0. A try just before the break for Argentina closed the gap and they drew level with a converted try after the restart. Kurt-Lee Arendse then ran the length of the field for his first try in Blitzboks colours to nudge his team ahead 17-12. Argentina got the crucial score and converted the try with less than a minute left on the clock. The Blitzboks attacked again, but a forward pass was ruled, ending South Africa’s effort. The focus now moves to Singapore. Despite their overall 7th place finish, the team benefitted from an equally poor performance by England, who also lost their corresponding matches. These results allowed South Africa to remain nine points clear of England on the World Rugby Sevens Series rankings in fourth spot overall. The top four teams at the end of the Series will receive automatic entry into the Rugby Sevens event at the 2020 Olympic Games in Japan. Fiji won the tournament for a fifth consecutive time, beating France in the final.